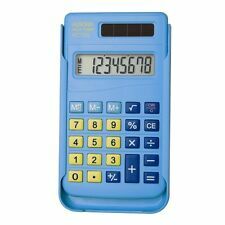 Small Kids Pocket Calculator Childrens Handheld School College Aurora HC133 New. It has a clear 8 digit LCD Display to enable easy viewing with battery installed. open like a book. size 6cm x 9.5. 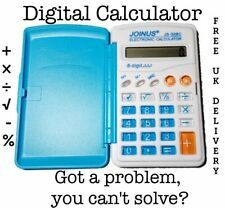 $2 X AURORA OFFICE DESKTOP ECO CALCULATORS. In used condition. See photographs for details of any areas of wear etc. Solar powered with battery backup. Large keypad for easy entry. Solar powered. Protective slide-on hard case. Large keypad for easy entry. Durable hard keys. ELECTRONIC CALCULATOR HC205. Red colour. AURORA Eco-Calc EC100 HANDHELD CALCULATOR. Greener Office Solutions from Aurora. Solar powered with a replaceable battery backup. Dual Powered Protection Using Greener Solar Energy. Recycled Plastic. for poor light conditions, and ‘auto power off’ for. Mark Up key - for Gross Profit. Huge adjustable 12 digit display. Solar and battery powered (LR54 included). Zero air miles travelled. Made from recycled plastic. Extra large angled display. Large keyboard. Large 12 digit display. Extra large commonly used keys. VINTAGE sc528 AURORA SCIENTIFIC CALCULATOR WORKING. Condition is Used. Dispatched with Royal Mail 2nd Class. AURORA EC240 HANDHELD/POCKET SOLAR ECO CALCULATOR. The Aurora EC240 handheld EcoCalc, is made from. Solar Only. cardboard and is battery free being totally solar. Battery free - solar power. It has a clear 8 digit LCD display for easy. Mark Up key - for Gross Profit. Large clear 12 digit display. WxDxH: 101x150x23mm. Auto on when you press any key. Rubber feet. 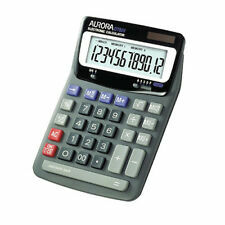 Aurora Heavy Duty 12 Digit Dual Powered Desktop Calculator with large keys and fixed angle display for easy viewing. Other features include Round up-down and decimal selector. Type Desktop Calculators. Large clear 8 digit display. Pocket calculator in full working order. Battery powered. Solar powered. 12 digit angled display. Made from recycled plastic. Aurora DT661 12 digit desk calculator. 1 x DT661 calculator. Instruction manual. Large adjustable 12 digit display. PC style Keyboard. 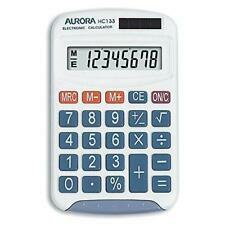 Aurora Multifunctional Calculator - DT661. Type Desktop Calculators. Product Details. 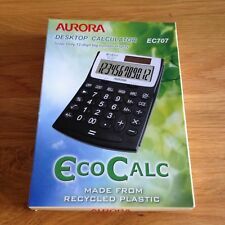 Aurora EcoCalc desktop calculator EC505. 12 digit big number display/dual powered. Made from recycled plastic. Large clear 12 digit display. DirecKey - Direct number entry. 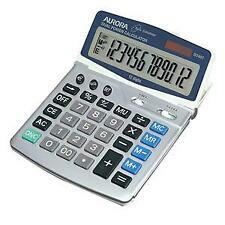 Aurora 8 digit dual powered pocket calculator which features large keys and a clear keyboard for ease of use. Type Pocket Calculators. Product Details. Solar powered with battery backup. Large clear 8 digit display. A chance for you to own this genuine AURORA pb654 printing Calculator in used and full working order. You will also get 11 rolls of paper. The AX582BL is great value scientific calculator suitable for use on all UK exams, that permit the use of calculators. Slide on protective case. 240 functions. Aurora Scientific Calculator SC582 Slim Light easy to handle Vintage Very Good Clean Working Condition Same day dispatch See ither items available on my list Thank You! Double zero and sign change keys. Robust large hard plastic keys. The Aurora DT401 is built for durability and reliability and is a great calculator for heavy duty applications, the huge 12 digit LCD display features extra large digits and is adjustable to enable easy viewing. SMALL HANDHELD CALCULATOR WITH BLACK COVER. IN GOOD WORKING ORDER AND IN GOOD CONDITION.